Photorefractive keratectomy was the first method of vision correction using Excimer laser. The first PRK vision correction was performed in Berlin in 1985. The photorefractive keratectomy technique involved non-contact Excimer laser treatment of cornea surface layers, having no influence on the eye inner structures. As with radial keratotomy only eye cornea was affected. But then there was no need to make incisions. The cornea shape was changed by laser effect which was evaporating the surface tissue. High accuracy allowed to achieve good result forecastability and decrease side effects significantly. But still the patient had to face uncomfortable period of the surface layer restoration (2 to 4 days) while complete adaptation took 3 to 4 weeks. Anaesthetic eye drops are applied (no general anaesthesia or anaesthetic injections are used). After anaesthesia took effect eye speculum is used to prevent eyelids blinking. The patient is asked to stare at the illuminated spot inside the unit to align the eye position. If necessary the eye is fixed using a vacuum ring. Epithelium is removed from the laser treatment area. Using he Excimer laser a new cornea shape is modeled. 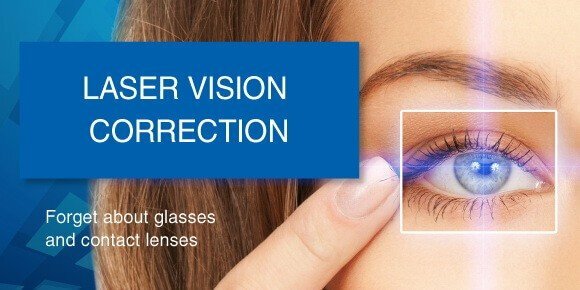 The procedure of the laser correction is conducted by an ophthalmosurgeon. When the laser correction is completed the cornea is bathed with a special solution. Antiphlogistic drops are used consequently. A special dressing is applied on the eye for protection. Vision correction using PRK remodels the outer layers of the cornea. This results in damage of the surface layers – epithelium and Bowman's membrane under it. Thus the laser delivery creates an open wound which is gradually covered by epithelium afterwards. The neogenesis (3 to 4 days) is associated with such uncomfortable sensations as photophobia, foreign substance sensation in the eye, profuse lacrimation, smarting eyes. To ease down the effects contact lenses are used. Bowman's membrane however cannot be restored. Therefore with high grades of myopia, hyperopia and astigmatism, and after 30-35 years of age (due to age-related changes) the rehabilitation period may have certain comlications. No deep surgery intervention is performed. Laser operating in the scanner mode “smooths and models” the cornea surface. Today the leading ophthalmology clinics refused large scale use of PRK method as there are too many disadvantages. This procedure is used only in cases of certain medical indications. More commonly used are other modern procedures as LASIK, LASEK, Epi-LASIK.